We bring forth for our customers a high quality gamut of Stone And Marble Gifts for our customers. 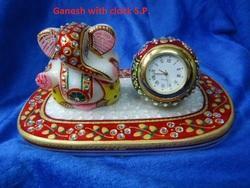 This collection is highly demanded in the market for its appeal and look. To maintain the quality high, our quality team keeps a control on the fabrications and keeps the distinction of these attractive gifts. 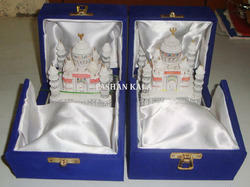 Marble Taj Mahal Tajmahal Replica/gift item. - Made with 100% pure white marble. The enchanting range of marble handicrafts is extensively demanded not only in the domestic but also in the international market. Due to the intricate and captivating designs crafted by our experts, the range outcasts other products available in the market. We are offering an high-end quality of Marble Gift Articles (Pot) to our clients, which can be used for home decoration purposes. These Marble Articles are exemplary of great artistic excellence and expertise. Only superior quality marble is used in these articles over which top grade paint is used for artwork. We Offer a wide range of best quality products in low price rate.